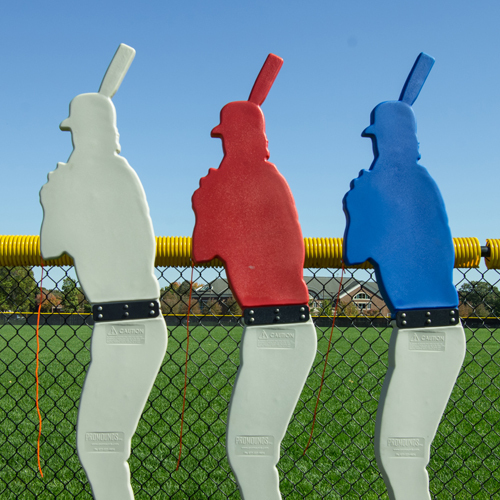 The Designated Hitter Pro Pitching Model creates a more realistic way to practice pitching. Practice with a real line of sight. The Designated Hitter Pro Pitching Model creates a more realistic way to practice pitching. Learn to pitch inside successfully and how to handle hitters who crowd home plate. Pitching model can be used indoors or outdoors use. Simulate both right handed and left handed hitters. For both baseball and softball. Durable construction so it won’t break. Safer beveled edges reduce pitch deflections. Jersey color options: blue, red, or gray. Practice anywhere, easy to move.